For starters, this was my very first half marathon. I trained from January to June to run this race and felt like I was really prepared when I ran it. I was armed with my gear that I had trained in included Brooks compression socks, Brooks Glycerin running shoes and my Tom Tom GPS watch. I was aiming for 10 minutes miles throughout the race, but would be happy if I finished in less than 2:30. We got to the start line bright and early and got into our dedicated corrals. Before we knew it, it was our turn to be at the start line. The first 6 miles went by super fast. I was averaging 9:00 miles and the roar of the crowd and bands kept me going. At about 6 miles, my husband had to take a bathroom break and that is where things started to get a little more challenging. By simply stopping for the toilet, I lost my momentum and struggled to get back into my rhythm. There were way more hills on this course than I was expecting and my longest run to date was only 10 miles and I did that on a flat course. The half marathon route takes you through a few tunnels that are hot and do not smell nice. One is the I-90 tunnel and the other is the 99 tunnel. Both were close to not bearable and I ran through each like my life depended on it. When we got to 12 miles, I was really struggling and had to take a long walking break. When I thought we were near the end, I got the dreaded Mercer street hill to take me to the finish line, this was rough and I really wished I had trained up to 13 miles in my running runs rather than just 10. I ended up finishing in 2:19, so made it under my goal time, but I was disappointed in the 2nd half of my race. If I do this course again, I will train more on hills to make sure that I am fit enough for the last hill of the race and will train to 14 miles, therefore, 13.1 will feel like a piece of cake. In your first race at any distance it’s always hard to pace and there are so many variables you can’t control. 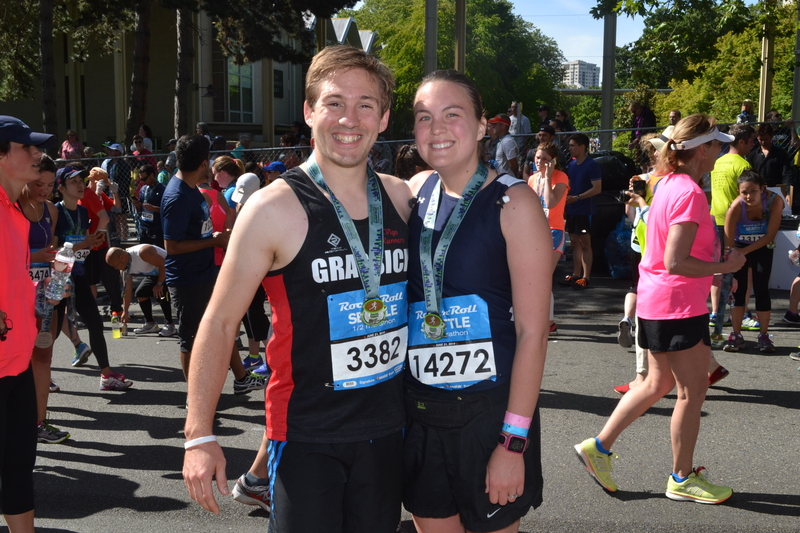 Feel good about a great race where you outperformed your goal! And it leaves you more room to improve for the next race, which is always a plus. Congratulations! Excited as I’ll be doing this in June!